December 18, 2010 - The fuselage-mounted hose-and-drogue aerial refueling system for the EADS North America KC-45 tanker has performed its first in-flight refueling contacts, with an F/A-18 fighter aircraft. This latest accomplishment builds on more than 1,300 aerial refueling contacts already completed with the KC-45?s other refueling systems for the U.S. Air Force, which include an advanced aerial refueling boom and wing-mounted hose-and-drogue refueling pods. Airbus Military completed a series of dry contacts on Dec. 13 using the first A330 Multi Role Tanker Transport (MRTT) for the U.K. Royal Air Force, one of four U.S. allies that have selected the tanker over Boeing tankers in four straight competitions. The EADS North America KC-45 is the U.S. Air Force configuration of the A330 MRTT, and is the only tanker offered in the Air Force competition that is flying and refueling on Thursday. ?Unlike our competitor?s concept aircraft, every refueling system we are offering the Air Force on our KC-45 is flying and proven, ready to meet the Air Force?s refueling requirements today,? said EADS North America Chairman Ralph D. Crosby, Jr. ?And 48,000 American workers are ready to build the KC-45 here in the U.S.? This week?s dry refueling contacts confirmed the excellent stability of the Fuselage Refueling Unit (FRU) hose and drogue in level flight and turns throughout the aircraft?s flight envelope. Installed in the belly of the KC-45, the digital FRU can provide fuel to the full range of receiver aircraft that refuel via hose-and-drogue ? including larger platforms such as probe-equipped C-130 Hercules airlifters and the V-22 Osprey tilt-rotor aircraft. The FRU is part of the KC-45?s four-point refueling system, which also consists of two removable digital underwing hose-and-drogue refueling pods and a fly-by-wire advanced Aerial Refueling Boom System. Both the FRU and underwing hose and drogue refueling pods share the same modular architecture, which greatly facilitates training and maintenance. All four of the KC-45?s refueling systems are controlled from the Remote Aerial Refueling Operator (RARO) console, located in the cockpit. This console provides high-definition, 3D imagery with laser infrared lighting for highly accurate in-flight fuel transfers day and night ? even during the most challenging operations. The KC-45 provides a highly mature, low-risk solution for the U.S. Air Force?s recapitalization of its aging tanker fleet. 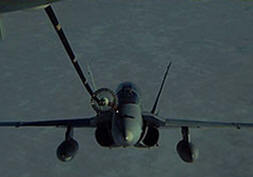 Its advanced refueling systems have been demonstrated and qualified in a full range of operational conditions, transferring more than 1.3 million pounds of fuel to receivers such as F-16 and F/A-18 fighters, the E-3 AWACS, and other A330 MRTTs.